Questions about Episode Eight? Visit the Ravelry thread to see if your question has already been answered. Don't forget to share your project on social media (Instagram is my favorite!) with hashtags #kdsweater and #solsticecardi. See below for links to where you can find me. And be sure to create your project page on Ravelry by visiting the pattern page, then clicking "cast on" in the upper right corner of the page. Kathleen is wearing Wavelette. Pattern available here. 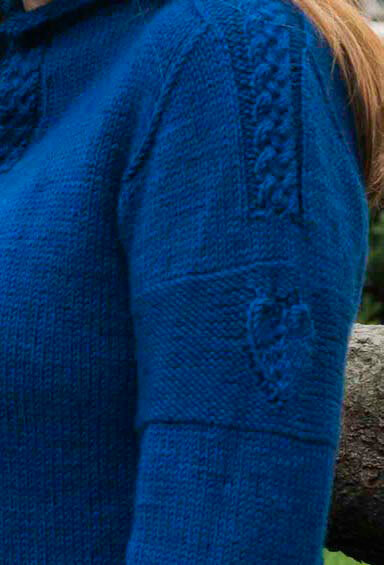 Lady Jane is wearing the original sample for Solstice Cardi in Julie Asselin's Stella yarn in the Diamant colorway. Don't forget to share your project on social media (Instagram is my favorite!) with hashtags #kdsweater and #solsticecardi. See below for links to where you can find me. And be sure to create your project page on Ravelry by visiting the pattern page http://www.ravelry.com/patterns/library/solstice-cardi , then clicking "cast on" in the upper right corner of the page. Questions about Episode Seven? Visit the Ravelry thread to see if your question has already been answered. Just one sleeve to go, then we will bring everything together in the yoke - my favorite part! Be sure to match this second sleeve to the one you made way back in Episode Three. And to keep you distracted from your (brief) visit to Sleeve Island, let's talk a little bit about our button options. I'll show you how I sew on a two-hole button plus give you some food for thought with shanked, cufflink-style buttons. Don't forget to share your project on social media with hashtags #kdsweater and #solsticecardi. See below for links to where you can find me. And be sure to create your project page on Ravelry by visiting the pattern page, then clicking "cast on" in the upper right corner of the page. Kathleen is wearing Bloc Pulli. Pattern available here. Hey, that's me answering trivia at about the 36' mark! Greetings from Knitlandia! Time to eat my Claramel. Don't forget to share your project on social media with hashtags #kdsweater and #solsticecardi. See below for links to where you can find me. 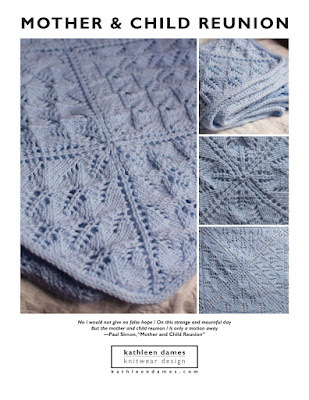 And be sure to create your project page on Ravelry by visiting the pattern page http://www.ravelry.com/patterns/library/solstice-cardi , then clicking "cast on" in the upper right corner of the page. Color-blocked cuffs, matching collar, navy body, orange contrast. Does that look like anything you might already know? Guess color blocking is still a fashionable thing. Do you think my Bloc Party cardigan will show up in a collection next Spring? Last summer I experienced another facet of the Intellectual Property dodecahedron when someone was selling a copy of my pattern for An Aran for Frederick on Etsy. That was a pretty clear case, and Etsy responded almost immediately by taking the pattern down. In this instance Ms. Beckham's Look 9 would be deemed nothing more than a coincidence, since, unlike Mati Ventrillon's experience with the house of Chanel, VB's design team have not visited my atelier (i.e. my desk in the corner of the dining room/book and yarn stash storage next to the washer-dryer/filming studio in our bedroom) ... ever. P.S. Guess my next pattern in the upgrade queue should be Bloc Pulli, eh? Share your project on Facebook, Instagram, and Twitter with hashtags #kdsweater and #solsticecardi. To celebrate the publication of Benwick (and Valentine's Day), use code persuasion2016 at checkout to receive 20% off this pattern, as well as my favorite Persuasion-inspired patterns, A Vest for Charles, An Aran for Anne, and An Aran for Frederick, from 11-14 February 2016. [Captain Benwick] had an affectionate heart. He must love somebody. Louisa Musgrove takes the air on the Cobb. She has finally recovered from her interesting illness and is escorted, of course, by Captain Benwick. A passing breeze gives our invalid a chill. Our gallant captain wraps his coat around her shoulders. How very interesting she is! And how ready to fall in love is he! Far from an exact replica of naval dress, this cardigan nods to Royal Navy uniforms with it's epaulet-like braids and clean front closure. It is also trimmed with matching braids at the collar, cuffs, and hem. In a nod to all the love Captain Benwick has to give, there is a heart on the sleeve. Feel like the heroine in your own novel! You've got your heart on your sleeve! 20 stitches x 30 rows = 4 inches square in Stockinette St.
Everything you need to create your own beautiful Benwick is provided in the professionally designed (by me!) pattern. Today it's all about that shaping, plus close-ups on different decreases. Did you know that the first stitch you stick your needle into when working a decrease indicates which stitch will come out on top? Stay tuned to find out more! Questions about Episode Five? Check the Ravelry thread first. Have you already created your project page on Ravelry? If not, visit the Solstice Cardi pattern page to cast on. Kathleen is wearing Mermaid's Cardigan. Pattern available here.